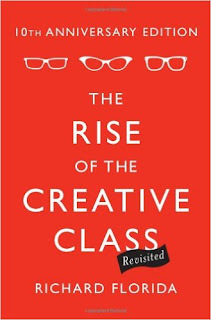 Arguably one of the most meaningful socioeconomic books over the past decade is Richard Florida's "The Rise of the Creative Class" For those who haven't had a chance yet to read it, read it. This book details the rise of intellectual creativity a la the Rennasance in the digital world across a spectrum of tech niches; from coding to 3D printing to design and even real estate. The vast majority of the world's population aren't landed aristocrats controlling huge swaths of land, but as Florida identifies, the creative class is leveraging their skills via technology, and especially the virtually limitless power of the cloud. A huge trend going forward of course is going to be voice/verbal commands, and Amazon.com's Echo Dot is perfectly positioned to take advantage of that creative wave. Frequent readers of this blog know that this author believes all wealth ultimately springs from the land, in one form or another (beauty of physical location, underlying minerals like Gold, or even clustering of talent.) Along those lines, the demographic shift into "hipster" cities has concentrated that very creative ability now amongst multi-hubs which have become in their own rights extremely valuable physical locations for manufacturing cloud-based services and products. I see no end in sight for this trend, especially as it fosters efficiency and meritocracy. An interesting area of ongoing and future development will be the utility combining the power of both verbal and AI commands into increasingly "smart" machines that will derive significant advantages from just-in-time manufacturing, idle time swaps, and latent repairs. In essence, manufacturing facilities that have largely become redundant or obsolete could once again rise to compliment the creative class production model. Labeled the "internet-of-things," this mechanical evolution hopefully has a long and promising future.